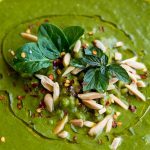 This is a green, healthy, powerhouse soup for boosting nutrition. High in protein and bursting with greens, peas, miso, nutritional yeast and healthy fats, this soup has it all. If you start with cooked split peas, it's done in 15 minutes! 1. Cook split peas with 2 cups water and the bay leaves, jalapeno, onion powder, and fenugreek until tender. This can take 30-45 minutes on the stove. I did it in my Instant Pot (or pressure cooker) in less than 10 mins. 2. While peas are cooking, add oil to a pot and saute the celery, chili, leek and zucchini until just barely tender (2-3 minutes). Add garlic and saute 1 minute more. 3. Add peas, spinach, chard, parsley, cilantro, sauteed vegetables, miso, yeast, coconut milk and water to a blender or food processor. Puree to desired consistency. Transfer back to the pot you sauteed the vegetables in and heat very gently until hot, but not simmering. If it simmers too much you will lose a lot of the vibrant color and nutrition. 4. Serve with a drizzle of high quality extra virgin olive oil, toasted almond slivers, celery or cilantro leaves and crushed red pepper. You can keep the soup chunkier by adding the cooked split peas after blending the rest of the ingredients coarsely.